It is hard to remember that it was just a mere four months ago that we had a foot of snow here, when we are currently enjoying days upon days of sunny weather and temperatures in the mid 20°Cs. To me, who quiet like the heat, this current spell feels like true soul nourishment. A way to fill up my cup after a long wet, cold Winter and Spring. The weather and the seasons are such a great metaphor as well as reminder of the cyclical nature of life. That even in the darkest hour, we can trust that the light will eventually return. Over the years the rhythm of my food choices has become fairly cyclical too. Warmer foods in colder weather and colder foods in warmer weather. Can you relate? I think it’s something that has evolved over time for me, the more I’ve allowed myself to let my intuition guide my food choices, the more seasonal my food choices have become. We can spend years of our lives fighting cravings and hunger signals, simply trying to ignore our bodies. We forget to listen. We don’t dare to trust. It can be a long arduous journey home. This summer I am taking 12 weeks, diving deeper into understanding the many mechanisms that underlie our relationship with food, eating and our bodies. It seems to be a subject that is vast and complex, yet it could (should) be one of the simplest things in our lives. Feeding ourselves. As much as I love creating new recipes, reading recipe books and photographing food, I equally enjoy working with clients and counselling people back to peace and freedom around food and eating. This kind of work is not linear, and more of a process than setting a goal to go after. It is intentional however. The intention being healing, freedom and peace. I will continue to unpack my learnings, observations and insights in other blog post. Now let’s get back to the recipe! I prefer my salads this time of year to be mostly raw, crunchy, to contain something salty (ought to replace those lost electrolytes!) and ideally assembled in minutes. We know from the science that eating a variety of foods, as well as plenty of colourful foods are beneficial to our health. So with that in mind I sometimes play a game of trying to see how many different types of food of the same colour I can fit in one dish. 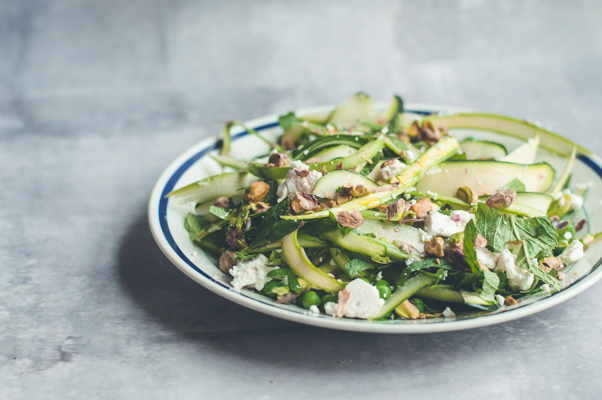 This Green Goddess Salad is one of those experiments. 1/2 cup of frozen peas, thawed or freshly podded ones if you can get some! Rinse and dry the courgette and the asparagus, then take out your vegetable peeler. 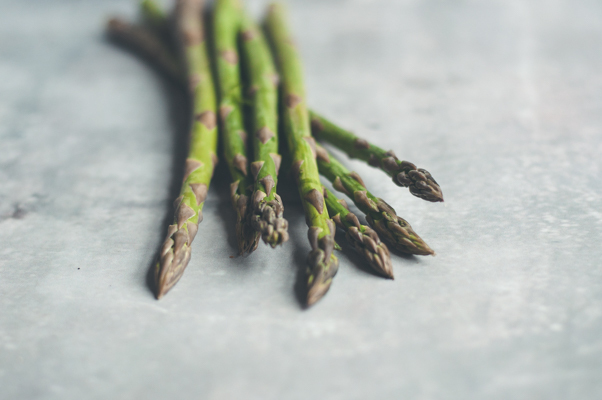 To make thin ribbons simply shave the courgette and then do the same with the asparagus spears. When you get to the more watery core of the courgette, you can leave this out. Defrost the peas by placing them in a bowl and then covering them with some boiling water from the kettle for a minute or so. Drain and rinse under cold water. Serve as is for a lighter summer meal, or as a side dish to a BBQ. Best eaten on the day it is made. Ok, so straight up I am going to admit that when I made this Summer Salad first, I didn’t intend to make it as a potential blog recipe. I was just trying to come up with some new meal ideas, as I was working on improving the variety of foods that I am eating. However, when I sat down to eat it, I loved this food combination so much that I decided to photograph the leftovers and then share the recipe with you all here! 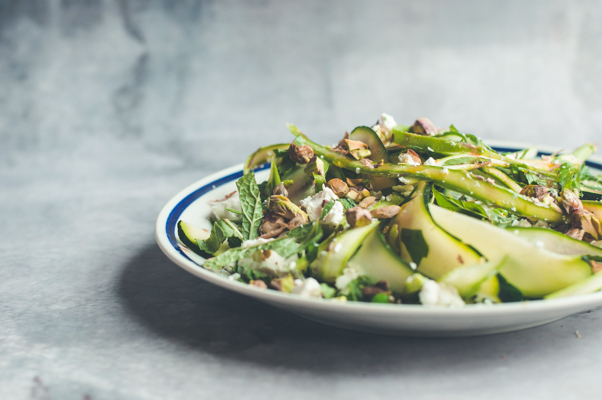 This Summer Salad works really well if you want to feed a crowd, as a mid week meal (having the grains pre-cooked and the veggies roasted in advanced) or as a side dish to a BBQ. I hadn’t had whole spelt grains for some time, and had actually forgotten how much I enjoy them. Especially in dishes like this. You will find whole spelt grain or Farro, in most healthfood stores. I always thought that Farro was just a different name for Spelt, turns out they are actually two different types of wheat, though fairly similar in taste and texture. This article breaks it down nicely. If you can only get Farro, then that will work equally well as both grains are chewy in texture with a slightly nutty flavour. The best thing with these grains are that they freeze really well too, so you can cook a large batch and then freeze any extra to use in future meals. I first came across spelt grains in a Swedish cookbook 6-7 years ago, at a friend’s place. I was so smitten with the simplicity of the recipes, as well as the beautiful pictures and I would consider it one of the books which changed my style of cooking and eating. And it introduced me to some new foods as well as ideas on how to make simple tasty colourful meals. Of course every body is different and will respond differently to foods, and only you can know what foods works best with your own body as well as within your own lifestyle. Meals and dishes like this one, seems to work fairly well for me. It always amazes me how some flavours and foods naturally marry together. Often you will find that those that do, tend to grow / be in season at the same time. It’s like Nature’s own natural rhythm comes through in flavours and combinations. It has also been said, that in order for a meal to be “complete”, it does not just have to contain the macro nutrients fat, carbohydrate and protein but should ideally cover all flavour profiles as well. Maybe this is why we sometimes want a bite of something sweet to just round out a meal that have been heavy on fat and protein? 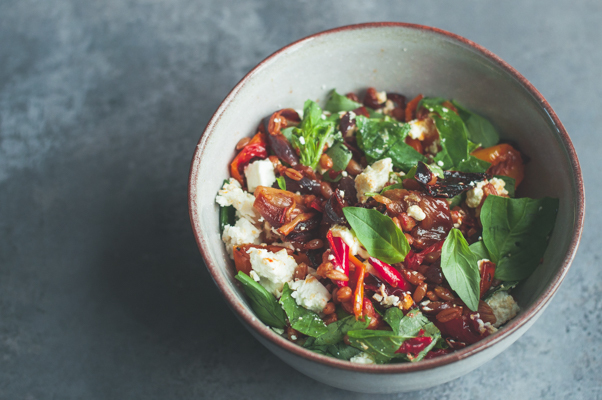 In this Summer Salad, I feel I’ve got it covered with some sweetness from the carmelised onion, some saltiness from the feta which also contributes with an element of cold if the rest of the salad is served warm. You will get some nutty and chewy texture from the grain, some sharpness from the peppers and a freshness from the basil leaves. I truly hope you will enjoy this Summer Salad as much as I do! Heat oven to 150°C. Place the chucks of pepper, the cherry tomatoes, the sliced onion and the whole garlic cloves on to a baking tray. Season with some sea salt and black pepper and drizzle with some olive oil. Toss the veggies in the oil to make sure they are evenly coated. Then place the tray in the warm oven and slow roast for about 1h. Stir the veggies once in awhile. What you want is a slight carmelisation of the onion and the peppers, but not burnt. The vegetables should be soft and fragrant. Once cooked set aside to cool down. To cook the grains; Rinse the grains well first to remove any dust or impurities then drain well before adding to a saucepan. 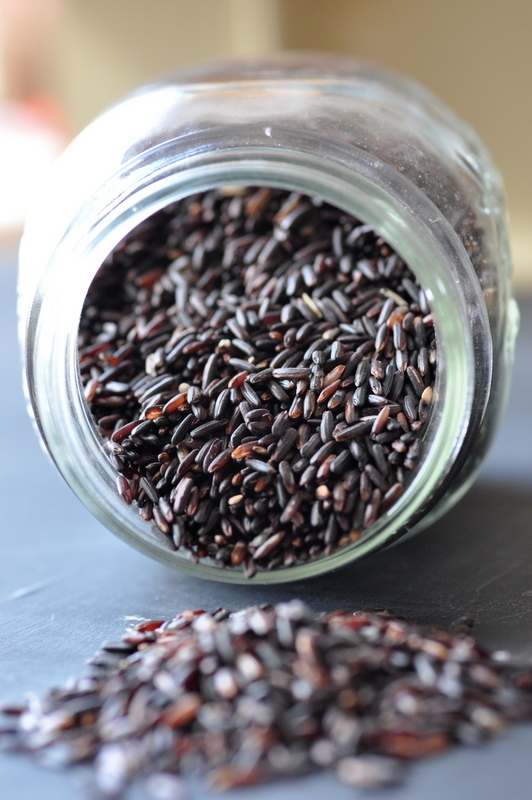 Cover the grains with plenty of water, bring to a lively boil and cook for about 45 min. The grains are ready when they are chewy but not hard. Drain and set aside. This salad can be served warm or cold and both the spelt grain as well as the slow roasted veggies will keep for a few days in the fridge. Assemble the salad by adding the slow roasted veggies to the cooked grains. Make sure you remove the skin from the roasted garlic cloves also. 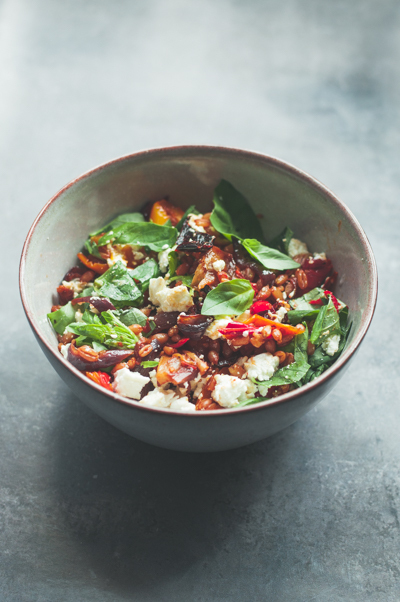 Add the crumbled feta and the basil leaves and then give the whole salad a gentle mix before serving. This week’s recipe is inspiration taken from a meal I enjoyed at a friend’s house when I was in Sweden a few weeks ago. I love when people cook for me, even though I love cooking and serving food for others too. The only downside is that many of my friends think I am a fussy eater, or strict with what I put into my mouth. To be honest, I’m neither. Though over the years my tastebuds have become a little fussier than what they used to be. I love simple food made with really good quality ingredients. That’s pretty much it. I also enjoy trying new foods and flavour combinations every once in a while. Actually… I probably (actually, not probably, I DO) spend a large chunk of my money on food. Like cool stuff, and rare things like romanesco, chicory lettuce and purple sweet potatoes… Or a better quality balsamic vinegar, that will make my simple salad dressings much more delicious! The balsamic vinegar thing happened when one of my friends gave me a tasting tour of her selection, after I’d complained that I don’t really like vinegar that much. Admittedly after trying a few of the once she had to hand, I realised that what I don’t like so much is apple cider vinegar or plain normal white vinegar, but that I do like a good quality balsamic, it tastes totally different! Who knew?! So I went and bought myself one the other day. Just to set the record straight. When I shot this recipe I used olive oil and pomegranate molasses + some lemon juice, however now armed with my new delicious balsamic purchase, I think using a good quality balsamic and equal quantities of olive oil will work perfectly here too. I found that the “proper” balsamic vinegar have a much rounder flavour and not that sharp “cut through” flavour like the cheaper stuff. Pomegranate molasses have a tart flavour, and is not overly sweet. 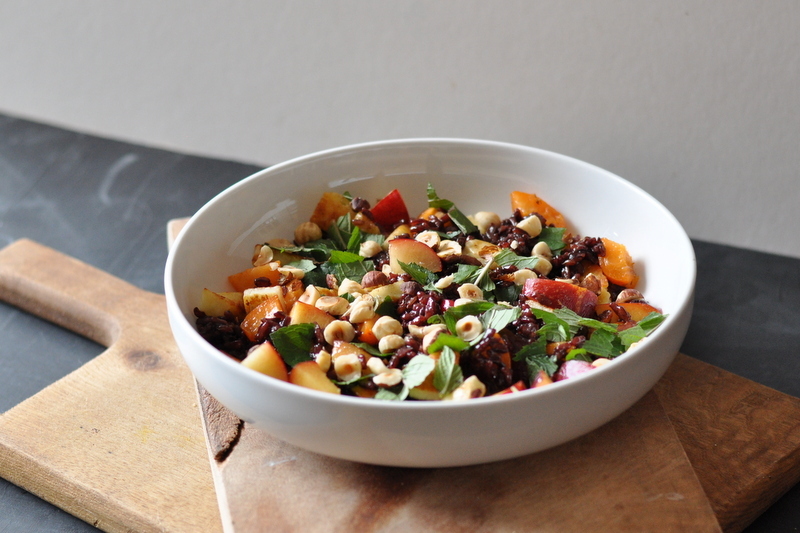 With this salad I’ve gone for a combination of fruity, salty and tart. The fresh mint will give an additional freshness and you will experience a full range of textures too. From chewy to crunchy to soft. Feel free to switch up the fruit or the grain if you can’t find any of the ingredients. Start by roasting the hazelnuts at 150˚C for about 15 min, until the skin begins to crack. 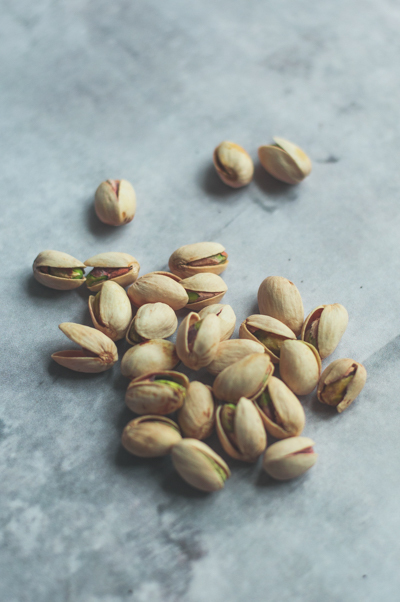 Once your hazelnuts are golden and fragrant, remove from oven to cool slightly before rubbing the skins off with a clean tea towel. Set aside. Measure out your rice, rinse and place it in a sauce pan. Add water and follow the cooking instructions on the package. Once the rice is cooked, set aside to cool. To make the dressing mix the oil, with the lemon juice and pomegranate molasses in a small bowl, or to save on dishes do it directly in the bowl you intend to serve your salad in. Once the rice have cooled, add it to your intended serving bowl and mix with the dressing. Heat a frying pan with a tbsp. of butter or olive oil. Fry off the halloumi until golden on both sides. 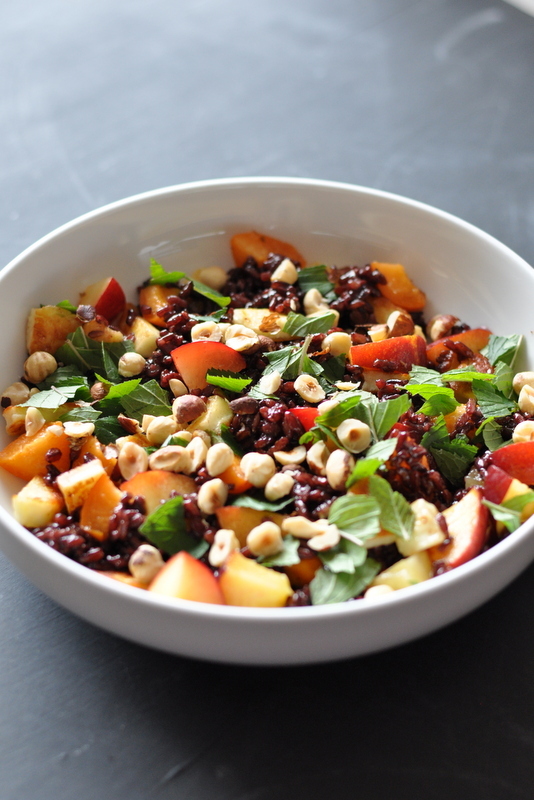 Assemble your black rice salad, by adding the fruit and the warm halloumi to the dressed up rice. Add the chopped mint leaves and the chopped hazelnuts. Let’s continue with the theme of sweetness. And summer. After about 10 days spent with my family in Sweden, where it wasn’t up the usual July temperatures, I subsequently returned to an Ireland which kind of is. So that inspired me to share this recipe I created a few years ago for a guest posting on someone else’s site, and since I’ve been a little short on time, plus the fact that there are some internal work currently being done to the house I live in (think dust, shambles and loud drilling noises) then coming up with something totally fresh and new felt too challenging. Here we are with an oldie, but a goodie. Perfect for summer. In these days of everyone going gluten free, dairy free, sugar free, vegan or paleo it can become a minefield to find something to eat, or serve, which is still tasty, nourishing and made from simple wholefood ingredients. Rather the opposite in fact. If you have to adhere to any food restrictions for health reasons they can in fact serve as a gateway into a more simplistic, holistic and diverse way of eating. In the end of the day no matter what latest nutritional trend you follow, doesn’t it just come down to the quality of the food in the end? How it has been grown and produced – with care. How it’s been prepared – with love. And how it’s being served and eaten- with joy! I don’t follow any particular dietary trend and eat most things which will make me feel good and do something good for my health. And if you’re going to cut something out of your diet for good, cut out the guilt. Michael Pollan, author of several books on food and the history of cooking, eating, agriculture etc. have the best advice I know, which is really straightforward. Eat (REAL) food. Not too much. Mostly Plants. Now let’s move on to the recipe. 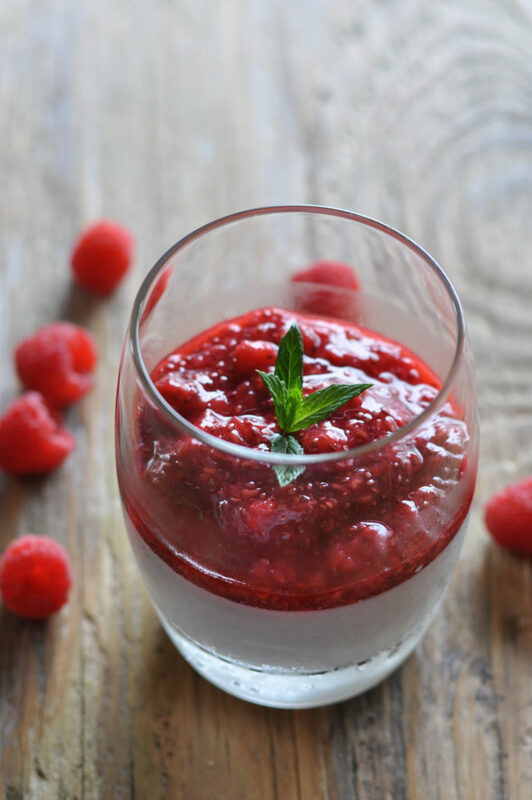 This is a simple, yet decadent summer dessert which should please the majority of your guests regardless of what they call themselves. what they can or cannot eat. Place coconut milk, vanilla bean paste, honey, lemon zest and agar-agar powder in a small sauce pan. Bring it to a boil while constantly stirring to make sure the honey dissolves and prevent the agar-agar flakes from sticking to the bottom. Once the coconut milk mix reaches boiling point boil for one min, then remove from to heat and allow to cool. Once the coconut milk has cooled to finger temperature pour it into small serving glasses and allow to set in the fridge. To make the chia jam; place your berries in a food processor / blender. Squeeze the lemon juice straight into the bowl of your food processor / blender. Blend until smooth. Transfer the blended berries to a container. Add in the chia seeds and stir until well combined. Let the chia jam sit for an hour or two to allow the seeds to gel. Stir a few times. 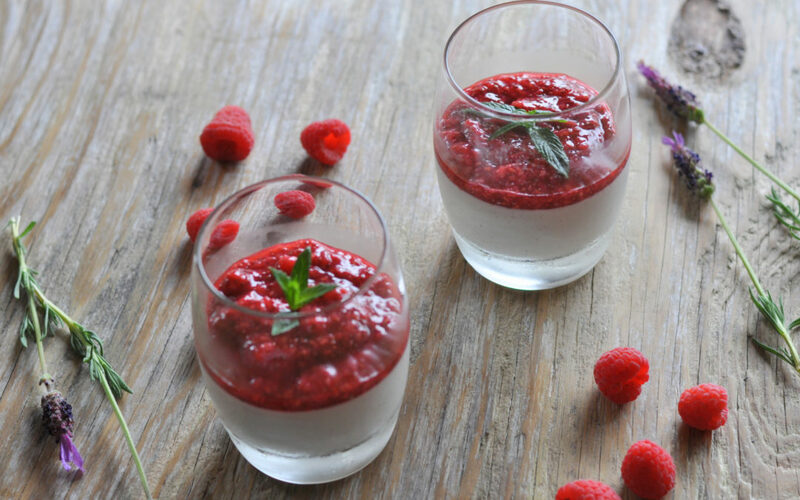 Add the jam on top of your set coconut panacotta to be served straight out of the glasses it’s set in. Garnish with a sprig of mint or some shaved dark chocolate. Note* I did not add any sweetener to the chia jam. You can of course do so if you want it less tart. 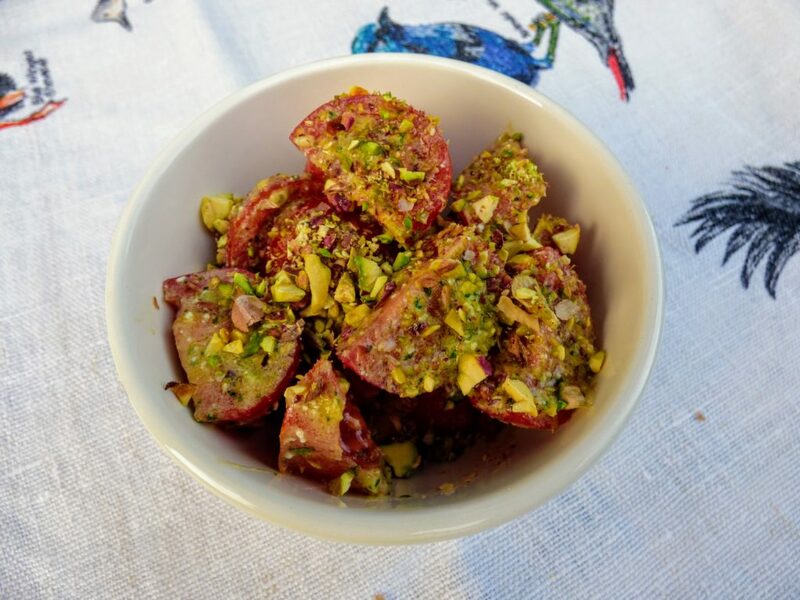 This week I have the honour and pleasure of sharing a simple and delicious summer salad, created by Joanna Bourke, from The Chopping Board with us all. I got to know Joanna through Instagram a few years back and really resonated with her no nonsense approach to food, as well as how we should eat and enjoy it. 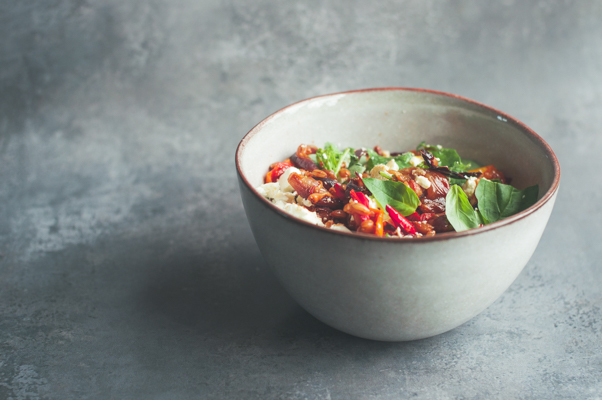 I particularly liked this blog post about the ebb and flow of life, and how letting our eating follow a similar rhythm is really nourishing. 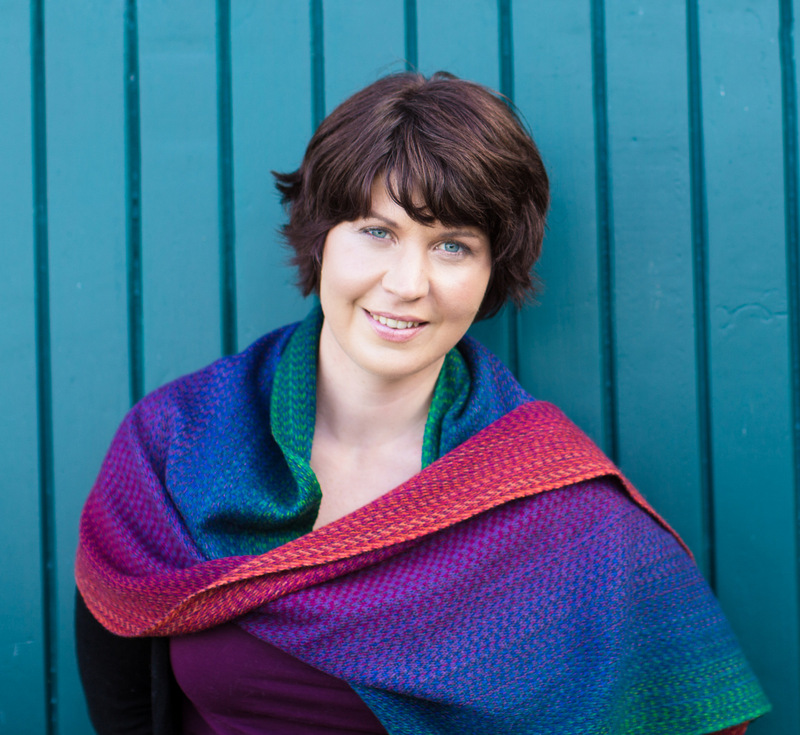 I hope you will enjoy our conversation and learning a little bit more about Joanna and the great work she does! I shared this purple smoothie over on Joanna’s blog. Can you tell us something about yourself and your work? My family have always enjoyed food and I’ve been cooking since I was young. My Dad had a fast-food business in Dublin and I worked there through my teens and college years. In 2014 I was working in Finance in San Francisco and started a blog of family recipes that I had in a notebook. In those days, my blog was called Some Like It Hot, after our takeaway! I loved sharing recipes and getting into food photography, and it was a great connection to home. Shortly after, I left my job in Finance and came home to Ireland to do the cookery course at Ballymaloe Cookery School. Since then I’ve been doing event and retreat catering in Ireland and abroad. I’m curious about your journey to become an entrepreneur and a chef? Can you please tell us how you came to do the work you do now? 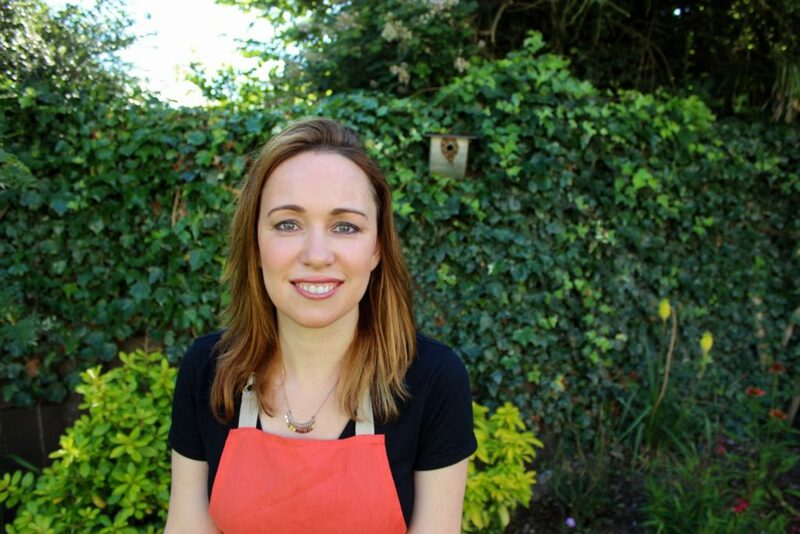 After cookery school, I took a career break and tried lots of different things to get a range of experience in the food industry, I worked with caterers and took on my own catering gigs , I got work experience in kitchens and did a month of private cooking in France. Getting blisters on my hand after a morning chopping veggies in a busy kitchen was a sign I wasn’t cut out to be a restaurant chef! In the last year I’ve been cooking at yoga and women’s business retreats in Wicklow, Cotswolds, Provence and Normandy. I’ve been lucky to travel to new places, meet interesting people and cook in some beautiful kitchens. At retreats, people often gravitate to the kitchen for a glass of wine and a chat about what’s for dinner. It’s the heart of a house, and my favourite place to be. And of course, I love it when people really enjoy my cooking. I’m still blogging, but the blog is now called The Chopping Board – good things start at the chopping board! I wouldn’t call it a philosophy so much as an absolute enjoyment of everything food-related – I love cooking and eating out, looking at food on Instagram, and I’m usually thinking about my next meal. At Ballymaloe we were completely spoiled with fresh vegetables and herbs picked from their farm every morning, the best organic and local meat produce, and fish caught locally in Ballycotton. Back in the real world, it’s a little harder (and expensive) to access this kind of produce. Farmer’s markets are great to get a sense of what’s in season and get the fresh vegetables growing in your area. Regardless of where you buy your food, a little bit of love and care in cooking can bring anything to life. Great basics for cooking – butter, olive oil, sea salt, spices and fresh herbs can really bring out flavour. Generally I think a little of what you fancy does you good. I usually cook pretty good meals for myself, but when I don’t feel like it my favourite takeaway is a Base pizza with a Peroni. Which 5 ingredients will one find in your pantry? Oats to make granola and smoothies, honey also for granola and salad dressings, Heinz tomato ketchup, Bachelor baked beans. The spices I use the most would be cumin and paprika. Do you have an all time favorite recipe you keep coming back to? This last winter I was doing a lot of one-tray roasts where I would add whatever I had to a roasting tin, and add some olive oil, garlic, salt and pepper. Potatoes, onions or leeks, chorizo, carrots and peas all work really well together. Roast a a high heat for about 40 minutes, or until vegetables are golden and crisp. Tell us something about the recipe you are sharing today! Why this particular recipe? This pesto came about when I forgot to bring basil pesto to an event I was cooking at. I didn’t have any basil and parmesan with me, but I did have parsley and feta, hey ho. I then added pistachios for some crunch. 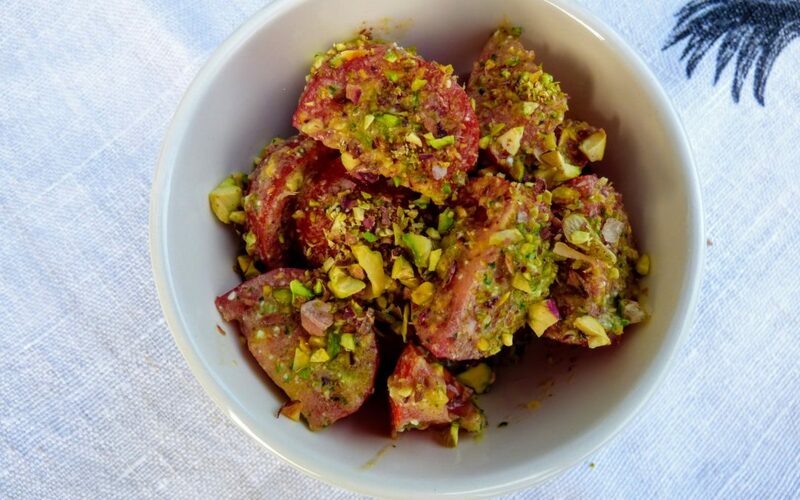 I’ve added it to tomatoes here for a summer salad but it also works great with pasta. To make the pesto, add the parsley, feta, olive oil, lemon juice, pistachios to a blender and blend until smooth. Taste, and add salt and pepper, although the feta will bring it’s own saltiness. Mix with tomatoes and serve on it’s own, or with pasta or scrambled eggs.